I finally got the pictures from Jeff this morning! I know most of you were there, but I wanted to share some anyway. 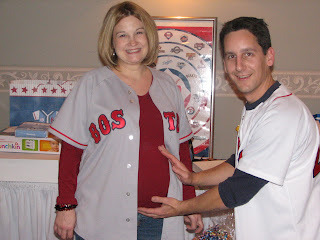 The theme was Take Me Out to the Ball Game, very appropriate for Jeff and me. My mom and sisters completely outdid themselves! And I think it is fair to say that everyone had a good time. The menu was Fenway Franks, Clam Chowdah, and Loaded Nachos. 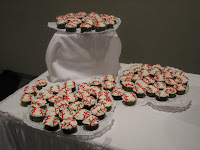 Then of course, for dessert, the baseball cupcakes complete with licorice lacing - yes, they were mildly crazed. I have to imagine that the lacing took near as long as baking the cupcakes! But they sure were yummy! 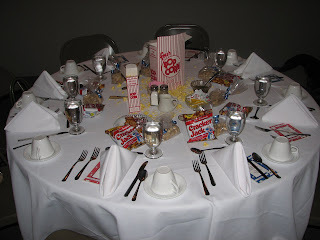 For games, you got to guess which candy bar was melted inside the diaper. It looked pretty much like the real thing... gross!! 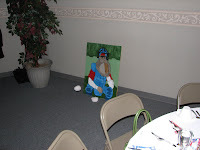 And then there was the catcher, that Tracey and Dad made.